A magnolia is a type of an evergreen plant with a very fragrant flower. There are about 80 different species of magnolia that are native to the eastern United States and southeastern Asia. The magnolia is pollinated by beetles. 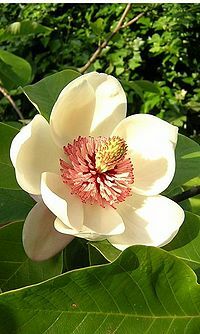 Mississippi is known as the "Magnolia State" and the magnolia (magnolia grandiflora) is Mississippi's state flower (and also state tree). The magnolia was officially designated as the State Flower by the 1952 Legislature. Mississippi's State Quarter was issued in 2002 and features a drawing of the magnolia on the obverse. The magnolia is also the state flower of Louisiana. It was designated the Louisiana state flower in 1900. This page was last modified on 27 June 2016, at 01:16.